As an instrumental Fellow, Miles Salerni plays timpani with the Tanglewood Music Center Orchestra. 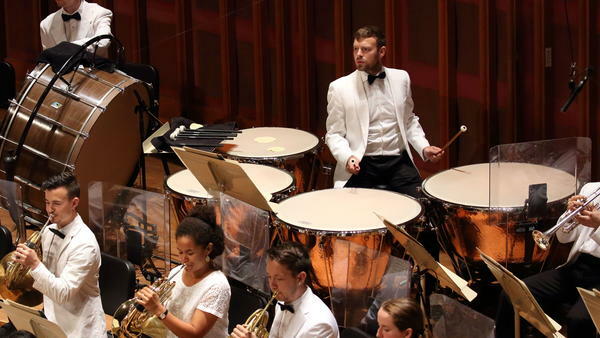 Miles Salerni, a 25-year-old percussionist, is one of this year's elite instrumental Fellows at Tanglewood, the Boston Symphony Orchestra's summer home in the Berkshires in western Massachusetts. But it took him a while to get there — five tries, to be exact. Many audition for this prestigious training program, but few are selected. When Salerni got rejected for the third time, he knew he had to find another way to get to Tanglewood. So he joined the stage crew — which proved to be more of a challenge than he'd expected. "When I arrived, I was under the impression that I would just be moving chairs and percussion instruments and stands and maybe setting up some risers for the orchestra," Salerni says. "I had no clue that I was gonna be climbing 45 feet in the air, trying to feed a rope through a pulley." John Demick, the BSO's stage manager, remembers when Salerni took on that task. "He got up on the catwalk, and about halfway down, he completely froze and said, 'I don't think I can do this,'" Demick says. "But he did. And you know what? I would hire him again today." BSO percussionist Kyle Brightwell says that during the two seasons Salerni was working on the stage crew, he still found ways to interact with the musicians. "Miles kinda knew everything that was going on in the percussion section," Brightwell says. "So we took advantage of that a little bit and said, 'Hey, Miles, can you grab us the tambourine? Hey, Miles, can you go grab us that Grover triangle clip that goes on a suspended cymbal stand?' We could say that to him and he would know what to look for." When Salerni wasn't looking for Grover triangle clips, he listened and learned. He'd go out into the audience during rehearsals and performances and soak it all in. Now, in the summer of 2016, his persistence has paid off. After five tries, Salerni is finally a Tanglewood Fellow. He got to play snare drum with his peers and the BSO on Tchaikovsky's 1812 Overture. "It's very exposed and it's nerve-wracking, but very, very fun," he says. "I do miss the guys back at the stage crew," Salerni adds. "But yeah, there's something special about creating music, especially with a young group of enthusiastic musicians." Here's a story about a young musician who learned if at first, second, third or fourth you don't succeed, try harder. Jeff Lunden reports on the surprising journey of percussionist Miles Salerni. JEFF LUNDEN, BYLINE: Hear the kettle drums in that piece? That's Miles Salerni, a 25-year-old percussionist who just made it to the Olympics of the classical music world. He's a fellow at Tanglewood, the Boston Symphony Orchestra's summer home in the Berkshires. But it took him a while to get there. MILES SALERNI: I got close. I got alternate the past four years, but yeah, it finally took this fifth time. LUNDEN: Many audition. Few are selected for this elite training program. When Salerni got rejected the third time, he knew he had to find another way. He joined the stage crew. It's a blue-collar job even if they wear white shirts and black bow ties. SALERNI: When I arrived, I was under the impression that I would just be moving chairs and percussion instruments and stands and maybe setting up some risers for the orchestra. I had no clue that I was going to be climbing, you know, 45 feet in the air, trying feed a rope through a pulley. JOHN DEMICK: He got up on the catwalk and about halfway down completely froze and said, I don't think I can do this. LUNDEN: John Demick is the BSO's stage manager. DEMICK: But he did. And you know what? I would hire him again today. LUNDEN: The musicians felt the same way, says percussionist Kyle Brightwell. KYLE BRIGHTWELL: Miles kind of knew everything that was going on in the percussion section, and so we took advantage of that a little bit and - hey, Miles, can you grab us the tambourine? Hey, Miles, can you go grab us that Grover triangle clip that goes on the suspended cymbal stand? We could say that to him, and he would know what to look for. LUNDEN: And during those two seasons when Miles Salerni wasn't looking for Grover triangle clips, he listened and learned. SALERNI: I went out into the audience during the rehearsals or the concerts and would try and just soak in as much as I could. LUNDEN: Fast forward to the summer of 2016 and the happy ending. LUNDEN: After five tries, Salerni is finally a fellow. He got to play snare drum with his peers and the BSO on the "1812 Overture." SALERNI: It's very exposed, and it's nerve-racking but very, very fun. SALERNI: Miles Salerni's former boss John Demick says the stage crew misses him, but they're thrilled. DEMICK: For us, it's incredible. I mean once I found out that Miles actually made it through, I may have been the first person to call and to congratulate him. SALERNI: I do miss the guys back at the stage crew. Don't get me wrong. But yeah, there's something special about creating music, especially with a young group of enthusiastic musicians. LUNDEN: For NPR News, I'm Jeff Lunden in Lenox, Mass. Transcript provided by NPR, Copyright NPR.